The MK4 GTi was a stop gap car, after the Turbo R32 and TT pushing 400 BHP it was a question of what next for Jon Watts MD of VAGtech. 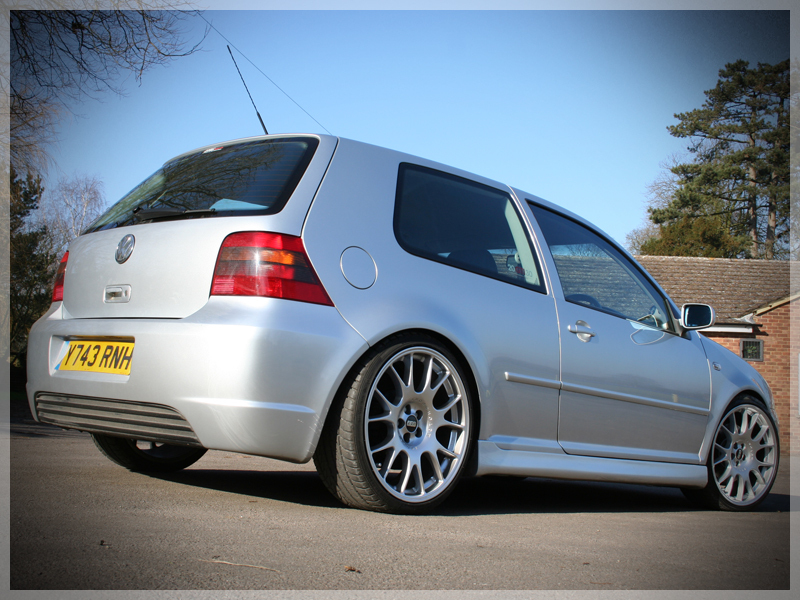 A customer was looking for a quick sale on a MK4 Golf GTi and Jon snapped up the chance. The car was completely standard low mileage and well maintained. A tuning project was what was needed. A set of wheels was a starting place, before long an R line bumper and side skirt kit was on it’s way. The opportunity to do a K04 turbo conversion came up and it was too good to pass up. To convert a K03 1.8 Turbo to use the bigger K04 Turbo found in the Audi TT is not a straight forward conversion, there are a lot of components that need changing, it is not just the turbocharger. Fuel injectors, inlet manifold, water pipes, wiring to allow for extra sensors and a new down pipe as the K04 turbo has a side exit, APS made a custom 3” downpipe for this project car. We decided to use the side mounted intercooler setup found in the Leon cupra R but upgraded the side mount intercoolers to use the large HPA units used on the R32 Turbo project cars. RS fabrications were commissioned to make the turbo outlet pipe and remove the baffle from the OEM pipe. Forge motorsport silicon hosing was used for all the boost system. With all the engine hardware in place we use Revo ECU software from the Leon Cupra R which had very nice linear throttle mapping meaning putting the power down was very good. KW V3 rear shocks and V1 front shocks were fitted. TT cast front wishbones and the longer neck front hubs were fitted along with R32 brakes all round. Inside R32 / R line aluminum trim parts were replaced to give the interior a more modern feel. The end result was one of the most modified project cars VAGtech had done but the drive was superb, the performance was stunning with close to 260 BHP, 100 BHP over stock this really was a very well sorted MK4 GTi.